Each latch is attached to the vent handle using two 1/2" screws. Remove both screws with a suitable Phillips head screwdriver. Discard the defective latch. Place the new latch into position and align the holes. Secure the new latch with the screws provided. Check for ease of opening and secure closure. 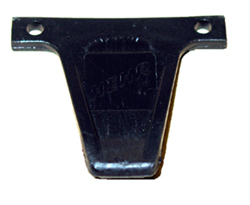 Each latch is attached to the vent frame with a screw through a nylon sleeve in the center. The sleeve keeps the screw from backing out as the latch is opened and closed. Remove the screw with a suitable Phillips head screwdriver. Place the new latch and sleeve into position and align the screw holes. Secure the latch, sleeve and screw and check for smooth secure operation. Note: older latches come in left and right configurations. Replacements may be used either way. 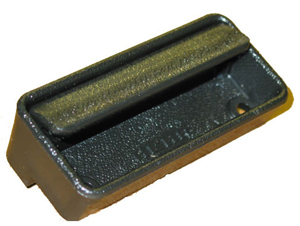 This latch is secured to un-branded vent glass with two screws through holes in the glass. (The screws are actually held by a threaded binding post on the backside of the glass.) 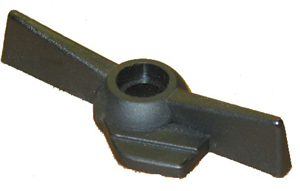 In addition, there are various spacers and sleeves that also must be used in this assembly. Thus, it is important that the vent glass be pushed as close to the mullion as possible during replacement. This will keep the pieces on the backside of the glass from coming loose, which could make latch replacement more complicated. Remove the two screws inside the latch housing using a suitable Phillips head screwdriver. Discard the defective latch. Place and align the new latch and the flat handle spacer with the binding posts in the holes through the glass. Secure in place with the screws provided. Be sure the screws are tight, but do not use a power screwdriver. Tighten by hand. Check for ease of operation and secure latching. 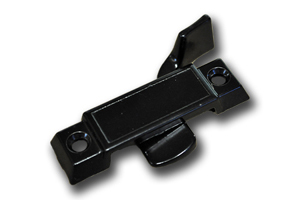 The latch is attached to the screen mullion with two rivets. Carefully center punch the rivet heads. Using a suitable power drill bit, drill off the rivet heads. Carefully remove the rivet shaft with a nail or drift punch. Discard the damaged latch. Place the new latch into position and align the holes. Secure the new latch with two pop rivets. Each latch is attached to the pound-on handle with a rivet through a nylon sleeve in the center. If the latch becomes damaged, carefully drill out the rivet head and attach the new latch using a suitable pop rivet.